Developed by Stand Alone, Inc., Crosswords for iPad is a feature rich puzzler solver’s dream. It’s elegant but not overdone, feature rich but not difficult to figure out, and all about business. 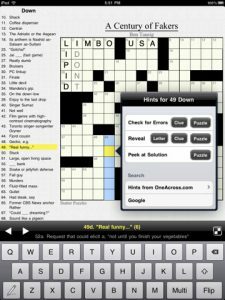 Best of all, it lets you keep all your crosswords in one place. Whether you’re looking for a list of starter puzzles, a place for uploading via URL, or a series of miscellaneous updates that rotate between the Houston Chronicle, Newsday, the Boston Globe, The Onion, Independent Concise, Thinks.com, Wall Street Journal, and a bunch of other sources including a French option, then Crosswords is your app. 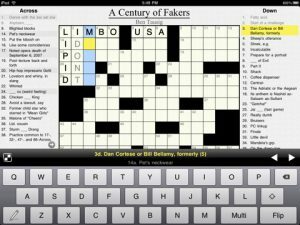 You can also use the app to sync subscriptions like access to The New York Times crossword puzzles, so that at the end of the day, you won’t feel shorted in the puzzles department. 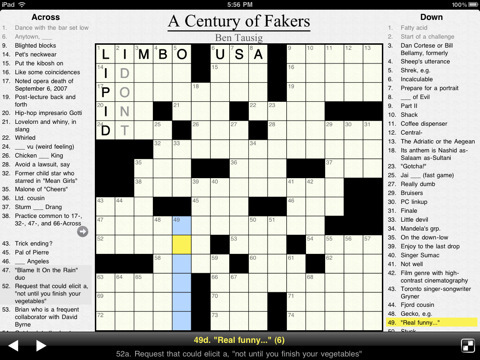 What’s great about Crosswords is how puzzle centric it is. It’s clear enough to have you solving in seconds, but also easy to customize for even the most picky of puzzle solving buffs. Opening the app brings you back to the puzzle you’ve started, covering almost the entire screen in portrait or landscape mode. The clues are clearly visible for both down and across, and the app automatically highlights the number and direction you’re working on in yellow while showing the same number in the opposite direction in grey highlight. When you fill hints in they turn into a light gray, and you can set the app to work in pen or pencil, write mistakes in red, and more. While the app’s keyboard actually seems to be easier to type on than the actual default iPad keyboard, you can also hook up an external keyboard to play with quick moving arrow keys and more. If you choose to use the regular iPad keyboard, the tab button lets you move easily between hints. Another button lets you switch orientation from down to across, and holding the next button lets the cheating inclined solvers take a peak at the entire solved puzzle and get hints or answers for individual words, letters, or the puzzle in its entirety. You can also check your progress, and go to the main menu to see your puzzles, change settings, and much more. 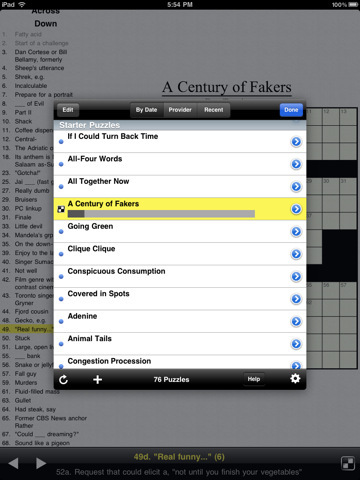 The overlay menu gives you access to puzzles by date, provider, and most recent downloads. Each puzzle is laid out in a list with dots next to what you haven’t started, and progress bars below the puzzles you’ve delved into. Puzzles that have been completed turn gray, and deleting a puzzle you don’t care about it as easy as side swiping the row. The buttons surrounding the list of puzzles on the main menu lets you sort puzzles by date, provider, and most recent downloaded puzzles. Other buttons include edit (which lets you delete manually via the famous trash can and add puzzles via a URL), sync, help, and settings. The sync button does exactly that, but if you set the app to sync on download you may never need to press it. Although the app is intuitive enough that I didn’t think I needed the help button I was amazed to see that the app packs even more features than I had originally thought. The clear and concise guide highlights the features and after a quick glance for example, I learned that pressing the comma key while entering a letter allows you to enter dual guesses in any given square. The last button on the overlay menu is the settings tab, which allows you to configure the puzzles you get (and enter premium subscriber info for consistent puzzles from papers like the New York Times). The settings key also lets you set preferences like whether you want to skip filled squares when typing, highlight mistakes in red letters or inverted text, send feedback to the developers, or set up keyboard preferences. This tab also lets you choose between a plain newspaper appearance and its darker counterpart, showing a puzzle timer, connecting via Twitter and Facebook, or creating an account that shows your position on the time hall of fame leaderboard. All said and done, this is a pretty comprehensive feature set for a clean, well done app. 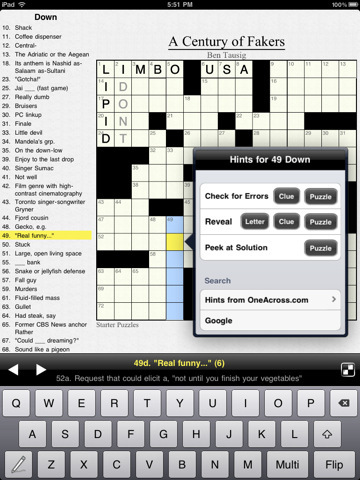 Bottom Line: Crosswords is a puzzle lover’s dream. It packs a great interface, intuitive design, and enough features to please even the most obsessed.